Exhibitors and sponsors have the opportunity to display press releases or SMALL press kits on literature racks in the EWEA 2012 press room. Delivery of the materials: The press materials should be delivered directly to the press room on 15 April 2012. Contact: Peter Sennekamp, EWEA Press Office, mobile: +32 496 91 93 15. Companies exhibiting at EWEA 2012 are given access to the press conference room for short press conferences (max. 30 minutes). There is only one press conference room available and time slots will be allocated on a first-come, first-served basis. No rental costs will be charged for exhibitor press conferences. Read the guidelines for the organisation of exhibitor press conferences. Treat your current and prospective clients: invite them to the event. Please note that you will be only charged for the invitations which have been retrieved against a visitor pass and that you will receive after the event a list of the persons who have used the invitations. It just takes one click for your contacts to see that you will be in Copenhagen! Add yourself to the LinkedIn event page. 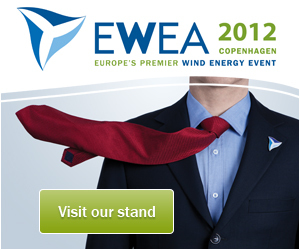 Become a fan of EWEA’s Facebook page. Take a breath of fresh air on EWEA’s blog. Subscribe to EWEA’s channel on Youtube. Follow EWEA’s photostream on Flickr. Download the high-resolution logo in JPEG, AI (Illustrator) or EPS (CMYK) version. Click on the links below to download the high-resolution banners. Click here to download the high-resolution email signature in JPEG in 350×100 px resolution. Click here to send an electronic invitation to your business partners.